Introduction: the metabolism and function of thyroid hormone is modified with aging. The reference ranges for thyroid hormones are derived from younger populations. With these ranges, the prevalence of subclinical thyroid dysfunction is higher in the elderly. There is controversy in the treatment of patients with subclinical disease. Objective: to describe the prevalence of thyroid dysfunction in older adults of the internal medicine outpatient clinic in a period of three months. 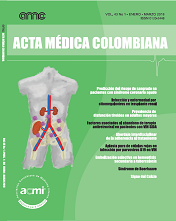 Material and Methods: cross-sectional study carried out in a university hospital. Participants were those patients 60 years old or older who attended the internal medicine outpatient clinic. They all filled out a questionnaire that included Wayne’s index and Zulewski’s score. TSH and free T4 levels were requested. Subsequently, each patient was contacted by telephone to record the results. Results: 93 people entered the study; 57% were women. 32% of patients received hormone replacement with levothyroxine; 73% were women. 66% of the patients receiving substitution did not have TSH levels in treatment goals.Two cases of subclinical hyperthyroidism were found and none of overt hyperthyroidism. The agreement beyond chance between the clinical scales and the diagnosis from laboratories was null. Conclusions: the prevalence of thyroid dysfunction in our country is high. More studies with standardization in diagnostic tools are required to define diagnostic and treatment cut-off points in these patients.